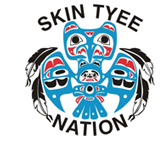 Skin Tyee Nation: one band of the people sometimes known as “Babine” in northern BC. The name seems Chinook Jargon to me, as if it referred to a fur-trapping chief. I notice that one current family name associated with this band is “Skin”. Edit 08/21/2014: Akrigg’s “British Columbia Place Names” says Skins Lake is named “after Skin Tyee, the chief of the little Indian community that once lived here.” He lived around the turn of the century (1900). Skins Lake is north of Ootsa Lake (now part of Nechako Reservoir).